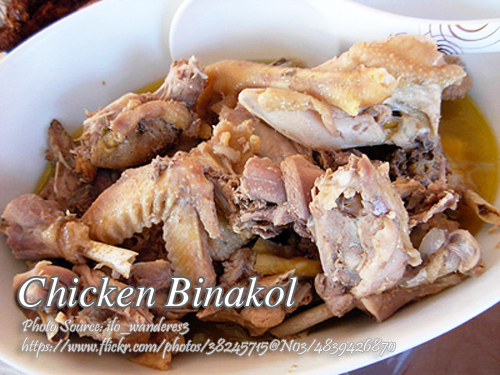 Chicken binakol is a popular Iloilo stewed chicken dish with coconut meat and water. This is very similar to the tagalog version of chicken tinola which uses green papaya and chili leaves for the vegetables. When cooking chicken soup like this chicken binakol, use native chicken or free range chicken which will produce a flavorful dish unlike commercial chicken breeds. To cook chicken binakol; Sauté garlic and ginger in hot oil until brown. Add onion and tanglad. Add chicken, patis and pepper. Saute for a while, pour rice washing, cover and simmer till chicken is tender. Remove chicken and debone. Return chicken to the stock. Add buko, buko water and dahon ng sili. Simmer a few minutes more. Sprinkle with the spring onion before serving. Sauté garlic and ginger in hot oil until brown. Add onion and tanglad. Add chicken, patis and pepper. Saute for a while, pour rice washing, cover and simmer till chicken is tender. Remove chicken and debone. Return chicken to the stock. Add buko, buko water and dahon ng sili. Simmer a few minutes more. Sprinkle with the spring onion before serving. 6 portions.